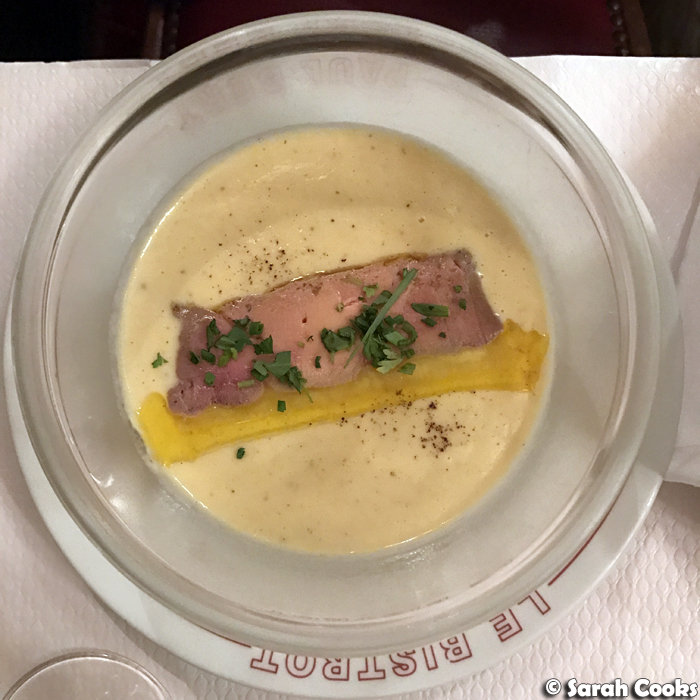 And now we get to the final post from my winter visit to Paris - dinner at Bistro Paul Bert! Clarice and I wanted to do a nice dinner out, and prior to the trip I googled some new restaurants, and was, predictably, overwhelmed with choice. One option, Bouillon, looked promising (check out their location tag on Instagram - wow! ), but was unfortunately closed over Christmas. Next time, next time. That popcorn mille feuille will be mine! In the end, we decided to go to an old favourite which we knew would be good - Bistro Paul Bert. You may remember that I came here with Sandra and her mum back in 2013, and was very impressed with the entrecôte and frites. Clarice has visited a few times, and I believe it's her default restaurant for celebrations. I'd wondered if Clarice might prefer to go somewhere new, but she emphatically replied: "I am always happy to go to Paul Bert!" Woop woop. So, we trekked across Paris on that freezing cold night, and were very happy to get into the warm and cozy bistro. 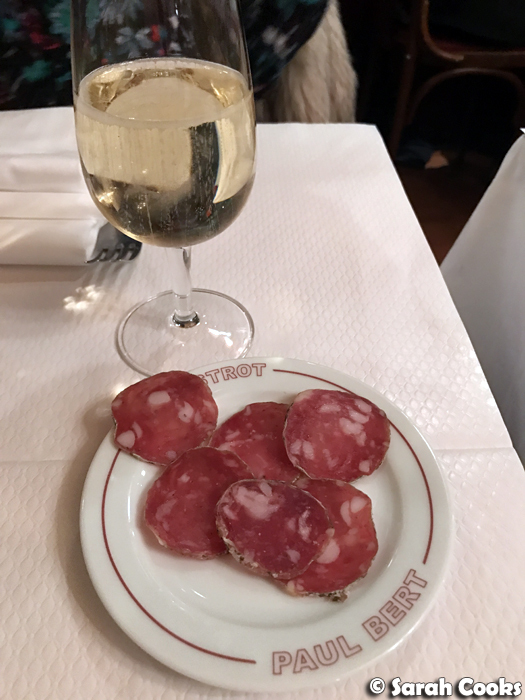 We started our meal with some fab (complimentary) garlicky sauccison sec, and a glass each of champagne. Santé! 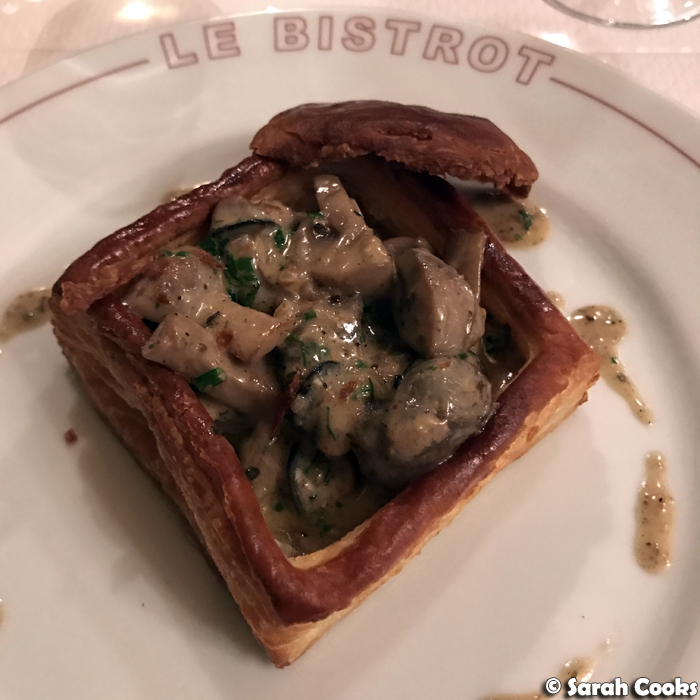 The word about Bistro Paul Bert is definitely out, and it's become quite the popular destination for discerning food-loving tourists. (They actually have a menu in English as well). 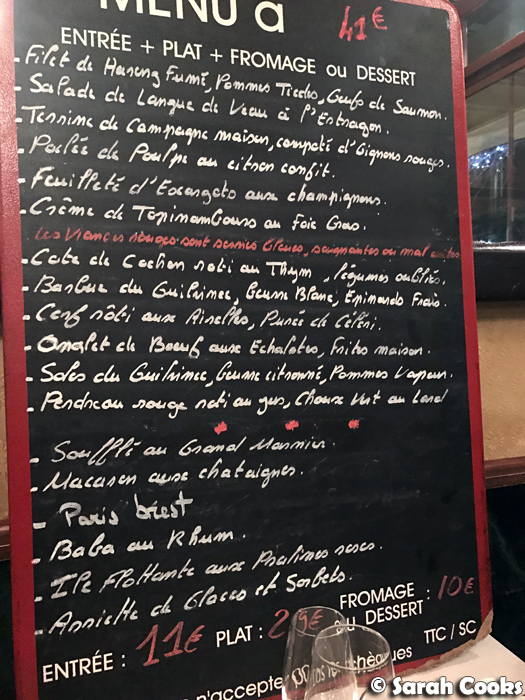 We stuck with the French menu - I gotta say, I had more trouble deciphering the handwriting than I did understanding the actual words! Hehe. Clarice's entrée was a creamed topinambours soup with foie gras. I didn't know what "topinambours" was, but a quick google search revealed: Jerusalem artichoke. It was gorgeous - rich and velvety and smooth. This made us think how much things have changed - back when we travelled through Europe together eleven years ago (check out: Europe 2006 for posts! ), if we couldn't understand a word on a menu, we just had to figure it out or text a friend. (When we had spanferkel in Berlin, we figured it might be hare and just had to leave it at that. Now I know it's suckling pig). We had no Google maps, no Google translate, no Instagram, no AirB&B, no iPhones - just our trusty digital cameras (5 megapixels Canon IXUS! ), some tattered copies of Lonely Planet books, and printouts of all our hostel booking confirmations. How things have changed! 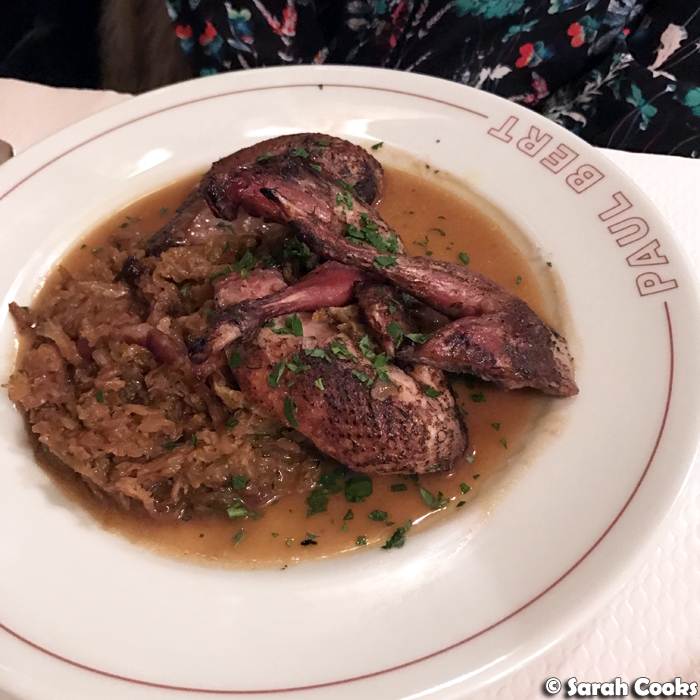 Clarice's main dish had a serious German / Alsatian vibe - roast red-legged partridge, served with bacon-studded green cabbage. 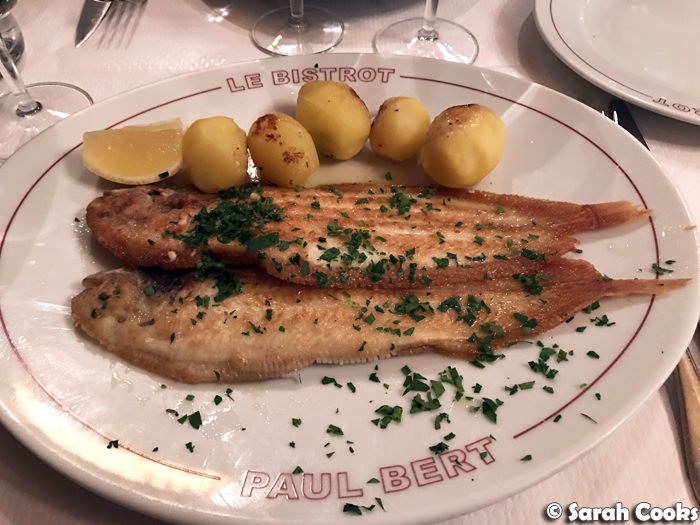 For my main, I ordered something that I'd seen on David Lebovitz' blog that I thought looked fantastic - pan-fried sole in lemon butter with steamed potatoes. I almost never eat whole fish and it's such a treat! However, after I ordered it, I kicked myself for not ordering something with a side of fries - Paul Bert's frites are really excellent. (Scroll to the bottom of my previous post to see them). Oh well, just an excuse to come back! Either way, the fish was a great choice - fresh and crisp and buttery and just delicious. So, we were quite full by this stage, but it was basically only 1€ extra to have dessert, so we persevered! 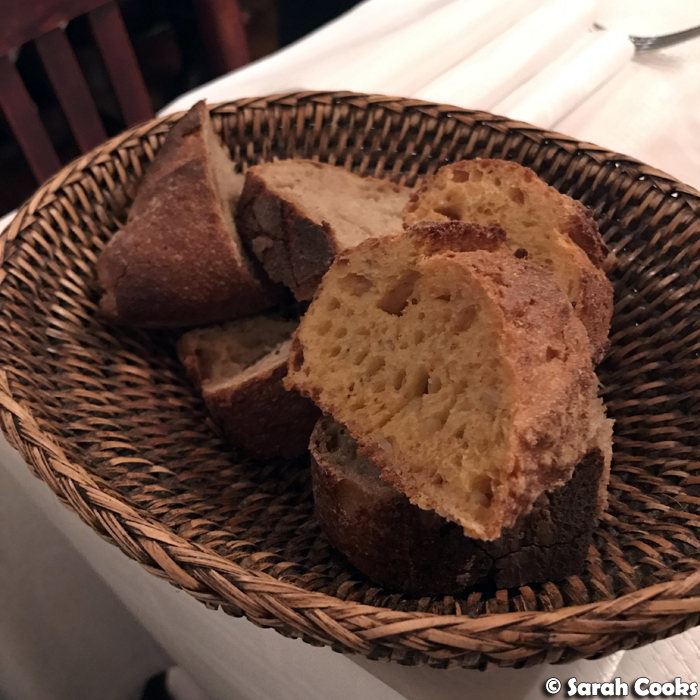 (It's 41€ for three courses, or 40€ to have an entrée and a main). 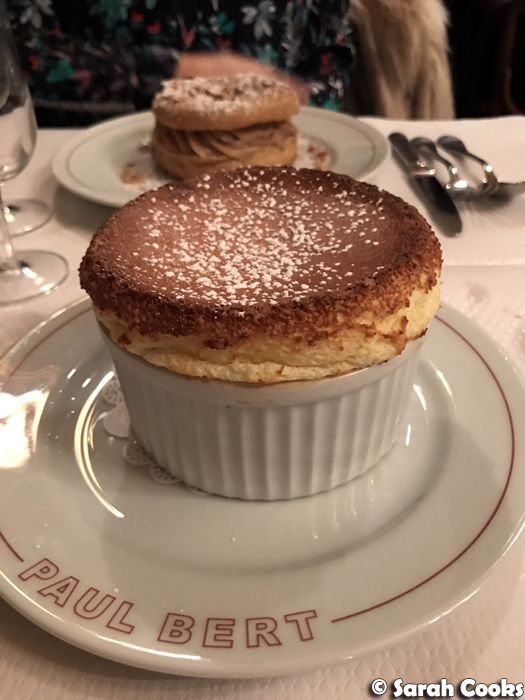 On Clarice's recommendation we shared a Grand Marnier soufflé and a Paris brest. (Hot tip: Paul Bert is famous for their îles flottantes and indeed, I tried one last time, as well as a lovely crème brûlée). Clarice definitely made the right choice though - these desserts were out of this world! 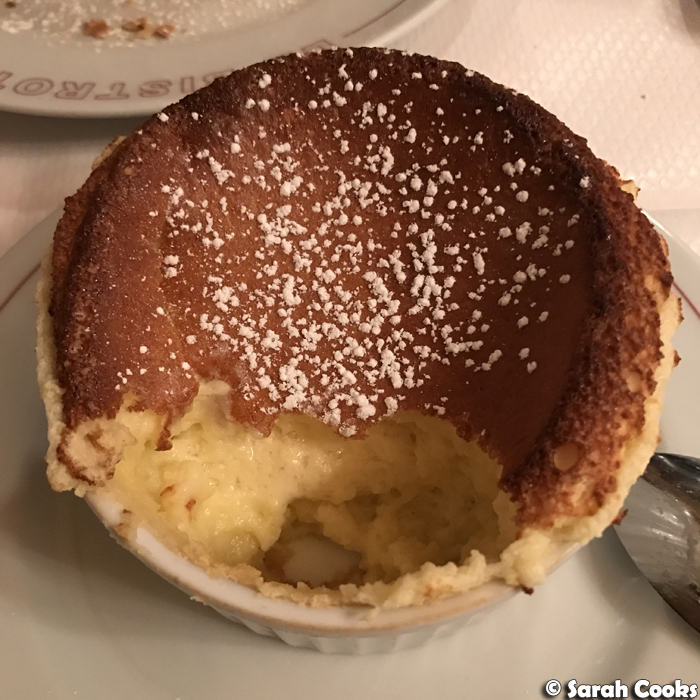 The Grand Marnier soufflé was impressively tall - it even stayed up for the time it took me to take these photos. It was light and airy, with a crisp top, creamy interior and a prominent, but not overpowering, flavour of liqueur. Gorgeous! 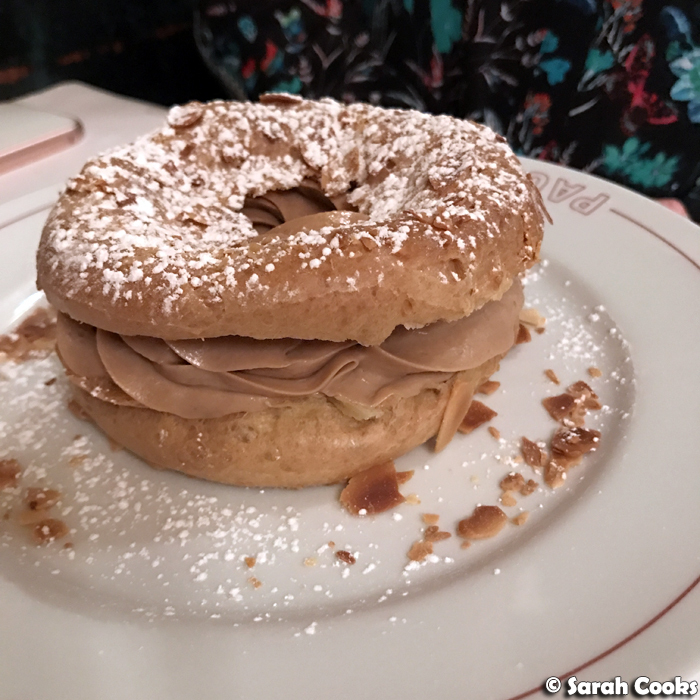 Even better, however, was the Paris brest. 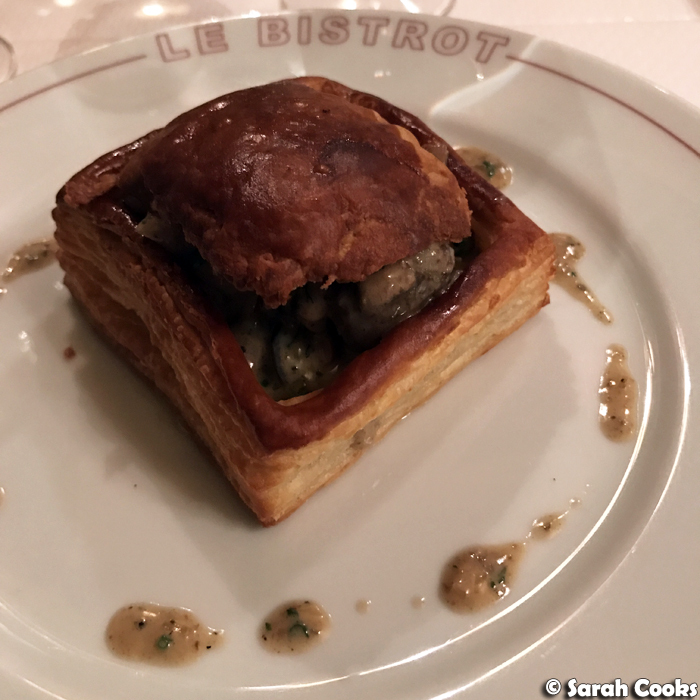 The choux pastry was perfectly fresh, and the praline filling was lusciously creamy, with a wonderful sweet, nutty flavour. Just quietly, I actually thought this Paris brest was even better than Jacques Genin's. Check out how creamy the filling was! Sheer perfection. 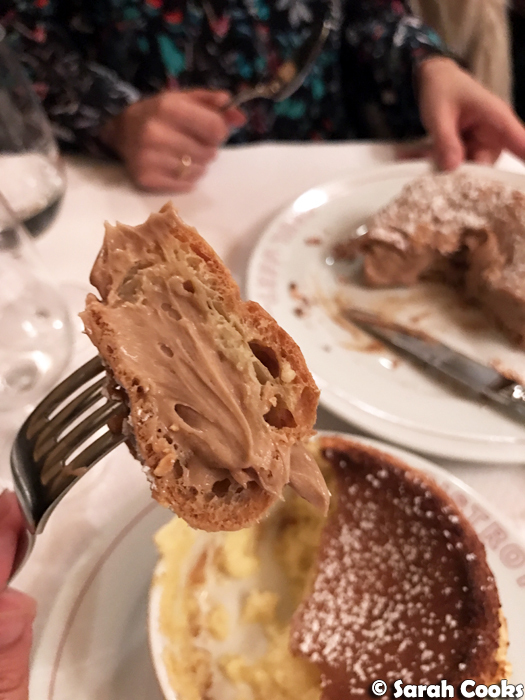 We actually couldn't finish both desserts - we valiantly completed the soufflé but were defeated by the Paris brest, and only managed to eat half. Clarice asked the waitstaff if they could pack it up for us to take it away, and they kindly did! (There is no way we would have wanted it to go to waste!) Even better, Clarice said I could take it home with me. Hooray! I took the precious cargo back to Germany with me (along with all the other sweet treats I'd purchased). It was just as delicious straight out of the fridge a couple of days later. As expected, it was a great meal and an excellent choice for our girls' night out and my nice meal out in Paris. It's pretty popular, so I'd suggest calling in advance to make a booking. I hope you enjoyed my posts on Paris! Let me know if you have any good recommendations for restaurants, cafes or other fun foodie destinations for future trips! Mmm I'd love some Paris Brest now! And you're so right, travelling has changed so much! I can't remember the last time I picked up a guide book! That Paris brest sounds incredible. And so good to hear they were happy to pack it up for you to take home. I agree - when food is that good you want to eat every last morsel, even if it's a couple of days later!